Contexts can be created within Squiz Matrix to allow you to construct multiple versions of single assets within the system. This enables the creation of multiple versions of pages within a Site that can be used in the construction of multi-lingual Sites, as well as mobile or internal versions of Sites. Multiple context Sites utilise the system’s Default Context and any number of user-created Alternate Contexts. 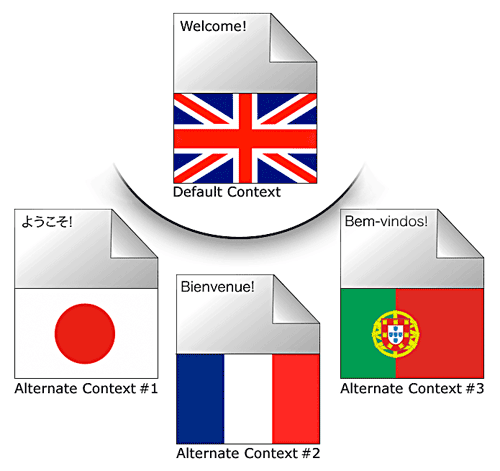 In the figure below, a Standard Page asset has been created in four different language versions: an English version of the page acting as the Default Context and Alternate Contexts displaying the page in Japanese, French and Portuguese. These pages can cater to specific users through the use of Context Detection. In the example above, Conditions for Context Detection can be set so that a user whose browser language is set to French will automatically view the French version of the page. Which Assets Can Utilise Contexts? Please note that not all asset information can be edited over multiple contexts. Asset attributes, such as the contents of a Standard Page asset, as configured on a Bodycopy Div, can be edited over multiple contexts, however, information such as the file contents of an Image or PDF File asset cannot be edited over multiple contexts. Listing assets (such as an Asset Listing, Search Page or Site Map) are able to return results stored against a specific context. Metadata Field values and their defaults can be configured separately for multiple contexts. Metadata can also be set as non-contextable, maintaining assigned values across all contexts. Paint Layouts are rendered on a Site by the currently viewed context. This means that if a Site is being viewed in an Alternate Context, any Paint Layouts will be displayed in their corresponding context. This allows the content of layouts to be customised for each context, for example, providing text in multiple languages. For more information on context-awareness within Squiz Matrix, refer to the Backend Operations chapter in this manual.